Jules Cheret: Artist Of The Belle Epoque & Pioneer Of Poster Art is "the first major English- and German-language publication on Cheret." Editor Michael Buhrs is director of Museum Villa Stuck, in Munich, where a Cheret retrospective exhibition was held in 2011. 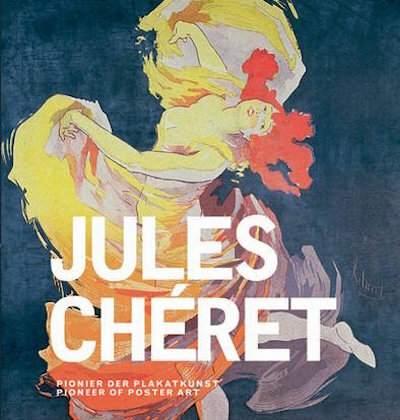 As Buhrs explains in his foreword, Cheret's poster designs were central to the Parisian Belle Epoque: "As a lithographer, printer, draughtsman, painter, interior designer and illustrator, he is a pre-eminent figure within the artistic and literary milieu of Paris at the turn of the century." Cheret is widely regarded as the first true artist of illustrated posters. In his History Of The Poster, Josef Muller-Brockmann writes that Cheret "introduced the decisive turning point in poster design. His work established the beginning of the modern poster." Cheret's prolific output, often depicting colourful, liberated women known as 'Cherettes', was largely responsible for the 'affichomanie' ('poster-mania') coined by Octave Uzanne. In his essay on Cheret and design, Martijn F Le Coultre quotes a contemporary description of Cheret as "king of the poster". Buhrs sees him as the "father of the modern poster", as does Philip B Meggs in his History Of Graphic Design. The Phaidon Archive Of Graphic Design describes him as "the father of the pictorial poster". In The Art Nouveau Poster, Alain Weill calls him "undeniably the father of the poster". According to Weill's comprehensive The Poster: A Worldwide Survey & History, he is "the father of poster art." Many of Cheret's posters were included in Les Maitres De L'Affiche, reprinted in English as The Complete "Masters Of The Poster". There are chapters on Cheret in Weill's The Poster and The Art Nouveau Poster, and he is also discussed extensively in Stephen J Eskilson's Graphic Design: A New History.